Posted on August 3, 2017 at 11:21 am. A recent poll has revealed 80 per cent of Canberra residents want to see major poker machine reforms to reduce gambling related harm in the community. The poll was conducted by market research group ReachTEL on behalf of Anglicare and the Canberra Gambling Reform Alliance, interviewing 717 people in July to determine the current community attitudes towards gambling in Canberra. The results showed Canberra residents across all ages, genders, and political beliefs believe pokie machines do more harm than good, and would like to see new reforms introduced to curb the damage. Strong support was shown for implementing $1 maximum spins on the pokies and introducing mandatory pre-commitment, where punters determine how much they are prepared to lose before they start playing the machines. 82-86 per cent of Greens voters were in support of this, along with 80-82 per cent of Labor voters and 75-77 per cent of Liberals. A majority of those surveyed (78 per cent) want to see a crackdown on the loophole that allows cash to be withdrawn via EFTPOS machines in gaming venues. In Canberra, there is a $200 limit on ATM withdrawals, but recent investigations have shown club owners are getting around this requirement by allowing punters to withdraw an unlimited amount of cash over the counter. Respondents were in support of a $250 limit per card per day on cash withdrawals in gaming venues. Close to three quarters of those surveyed supported the idea of an independent body being appointed to administer community contributions generated by pokies revenue. 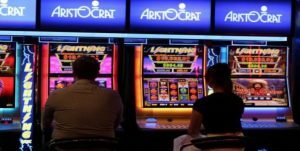 Earlier this year, it was revealed several of ACT’s gaming clubs were donating pokies revenue to themselves. While there has been a lot of focus in the media about limiting the number of pokies available in the ACT, the poll showed the community is more concerned about restrictions on how much money can be spent on the pokies at a time. 43 per cent of respondents supported a large decrease in the number of pokies, 18 per cent supported a small decrease and 31 per cent said the number of machines should stay the same. The poll also revealed a decline in support for Labor since the election, with current support at 36.4 per cent. Canberra Gambling Reform Alliance co-chair Rebecca Vassarotti said the results of the poll show it’s time to introduce new legislative proposals.